That little brass thing is a holy water font from Italy that two of my aunts got us as a wedding gift. Veil: black chiffon triangle with pink and rose/vine embroidery, from Catholic Home and Garden. It looks like mine is discontinued. I cannot recommend them highly enough. The lady who makes them is an artistic genius. Her veils are GORGEOUS. They’re not nearly as expensive as my second favorite purveyor, Veils by Lily, and there is an amazing array of unusual styles. My first veil was a cheap little thing I found in a Catholic bookstore. It was a triangle cut out of one kind of polyester lace (badly enough that you could still see the sharpie outline in places) with some other polyester lace trim sewn on, and not very well either. It was about twelve bucks if I recall. This one was $28. I’ve been wearing it almost two years and it still looks like new. Plus she sends you your veil inside a damask pouch with a little sachet of rose potpourri in it. It’s the little touches, you know? Blouse: blue with some stylized roses. I got it at Goodwill on a half-price Saturday. The brand is Hillard & Hanson. *shrug* I’ve never heard of them before either. Usually I groan with disappointment when I see some article of clothing in a WIWS that I really love and want to find, but the poster got it at Goodwill… Here I am, dishing out the groans. Layering piece: The bottom of a nursing cami by Bravado. Those suckers have a built-in bra with wide, slightly padded straps, not just a wimpy little shelf thing with those little spaghetti straps that threaten to slice your arms off, which means REAL SUPPORT. I don’t want to get too personal on the first day, so let’s just say that after giving birth, certain body parts now need architectural engineering to be properly accommodated. When my grandma saw this she said that my undershirt was sticking out. She’s not a fan of this newfangled “layering” trend. 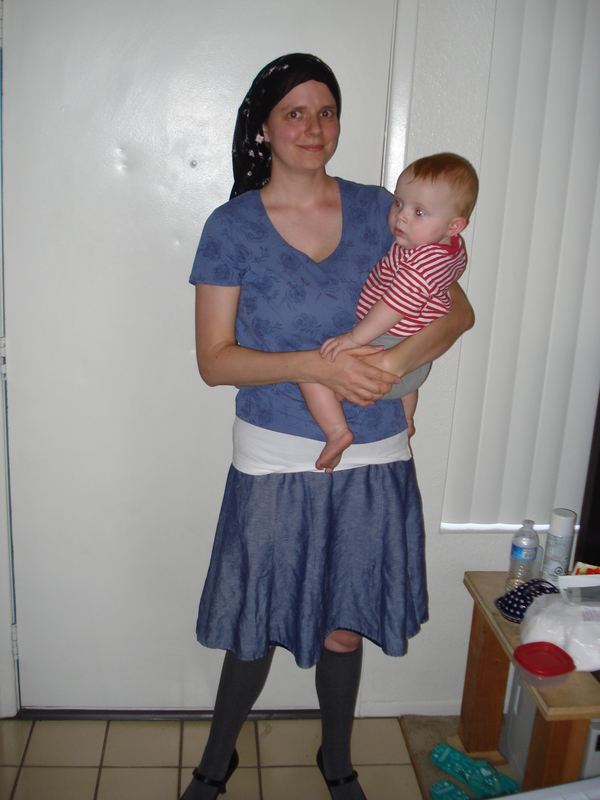 Honestly I wish I had gotten a picture of the workaround I did just for her – folding up the bottom of the cami and smoothing it flat – because I think the ensemble did look better without the band of white hitting at a not-so-flattering level. 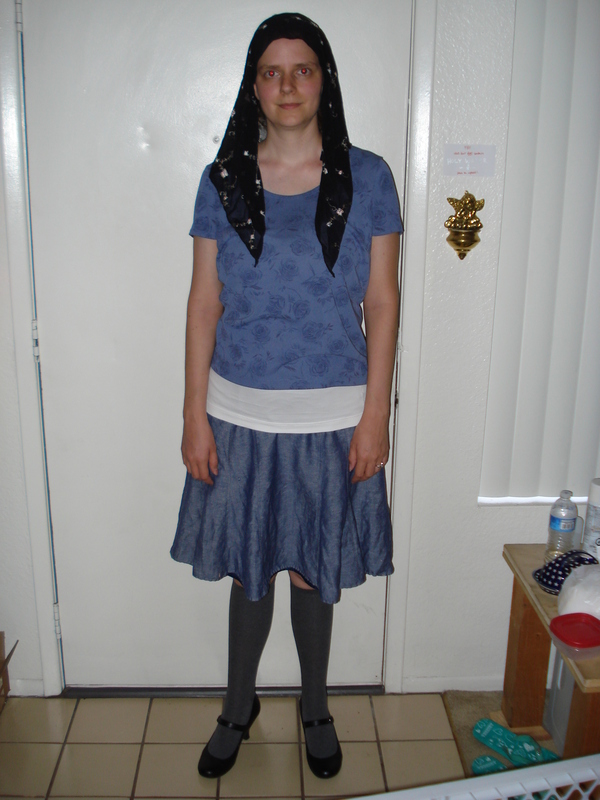 Skirt: fully lined tencel skirt from Coldwater Creek in grey-blue. It has very slowly been shrinking over the years, so that’s why it has those funny looking wrinkles near the bottom. I got it from the clearance section during their ultimate sale of the year when pretty much everything is some enormous percentage off, like 75-80%. That’s the only way I could afford stuff from there, and now that I’m married it’s pretty much out of my league entirely. But it is Really Nice Stuff, and the sales are excellent. Especially when you find one happening at the same time as free shipping. They have such beautiful, well-made clothes. ~sigh~ It is also, ahem, hiked up a little higher than when I first bought it… what with not having that virginal figure anymore… So that’s why it doesn’t cover my knees anymore. Socks: kneehigh grey socks that I got for Christmas a few years back. I am most assuredly NOT wearing them because I was cold. In fact, it hit 103 degrees today. I am wearing them because it hides the fact that I didn’t get a chance to shave. Der Kinder decided he was going to make me clean up his enormous mess instead of taking a shower this morning. Shoes: basic mary jane heels from Payless Shoe Source. I got this black pair and a brown pair a few years ago when they were having a buy one pair, get another half off thing. I think they went for $20 normally. Polish pottery butter dish, borrowed tupperware that used to have homemade salted caramel in it, a good bottle of regular holy water, and a sharpied-up water bottle with Epiphany water in it. Oh yes, and a can of spray base-coat paint for my husband’s Warhammer minis. In case you were wondering. He wore a red and white striped onesie (Lands End) and a pair of grey cargo shorts, both from a really big twice-a-year consignment event. You may note my super-fashionable pirate-babushka veil treatment – I tie the ends behind my head so he can’t pull on them as readily. 2. My underwear is showing (thanks Grandma). Good thing I live in 2013 and not 1903, then. ‘Tis a start to combatting weird dowdiness, yes? Till next time! This entry was posted on Sunday, April 28th, 2013 at 11:05 pm	and posted in Uncategorized. You can follow any responses to this entry through the RSS 2.0 feed. you look very nice. Not sure I could pull off the veil, but I am prayerfully considering it.